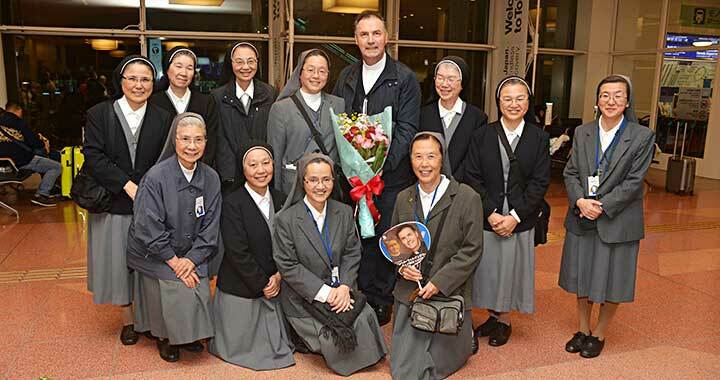 Tokyo, Japan, 7 November 2018 -- Fr. Ángel Fernández Artime, SDB, the Rector Major and his secretary Fr. Horacio Lopez arrived safely at Haneda Tokyo airport late at night on the 7th Nov. 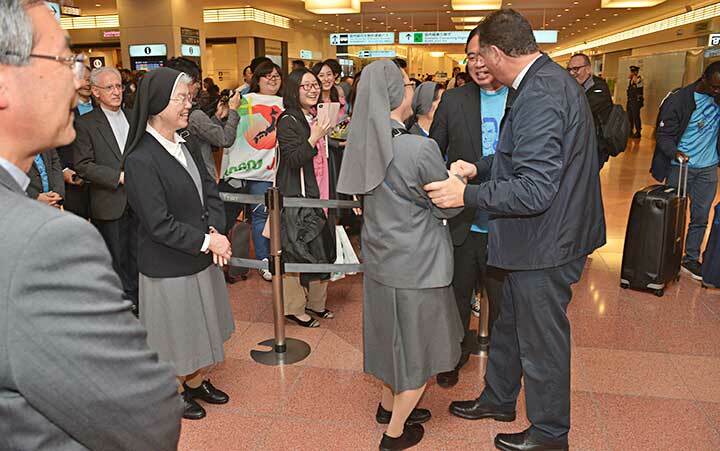 The Visit of the Rector Major to Japan is the first time in six years since that of the former Rector Major, Fr. Pascual Chávez Villanueva, SDB in 2012. This time Fr. Ángel is going to stay in Japan for 6 days. At the airport, 45 people including Fr. 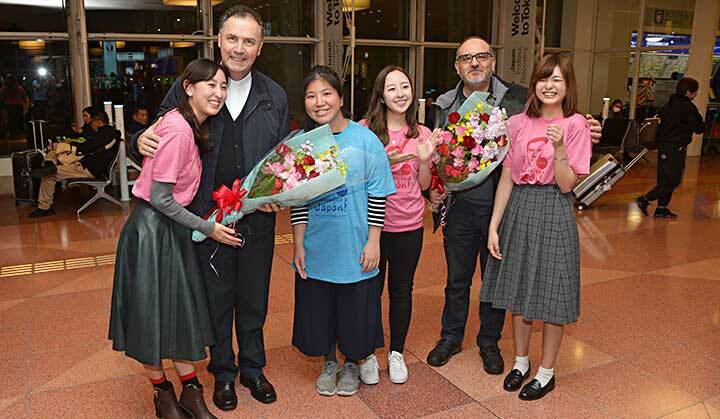 Provincial Jacob Hamaguchi, SDB, Bishop Mario Yamanouchi, SDB (Saitama Diocese), the members of the Salesian Family in Japan, and the young people enthusiastically welcomed the Rector Major with the special joy. Receiving the bouquets from the young, the Rector Major said hello and gave us big smiles despite of the long trip. 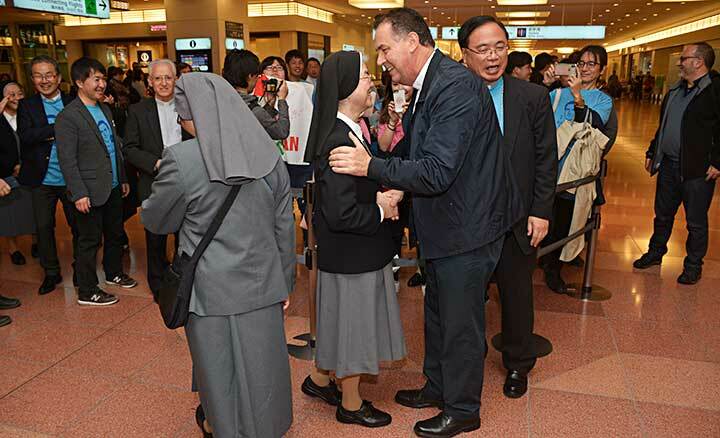 From the next day, the Rector Major will visit Miyazaki (Salesian School and House of Caritas Sisters of Jesus), where the first Salesians in Japan (lead by Fr. Vincenzo Cimatti, SDB) started to work, Tokyo (Chofu Salesian Seminary, Kodaira Salesian Boy's Home, and Akabane FMA School, etc.) and Yokohama (Salesian School). The Rector Major will meet the Salesians, the members of the Salesian Family, and of course the youths and school students in every place, and have the time for exchanges and sharings with the heart of Don Bosco, the Father, Teacher, and Friend of the Youth. Welcome to Japan, Don Ángel!